This layout automatically adjusts the layout depending on how many dials that are used. Changing the number of used dials will automatically change the layout. This will also be stored in the preset. Choose between 4 different dial types. You can also choose to not show the dial at all, and only show the content of the dial. 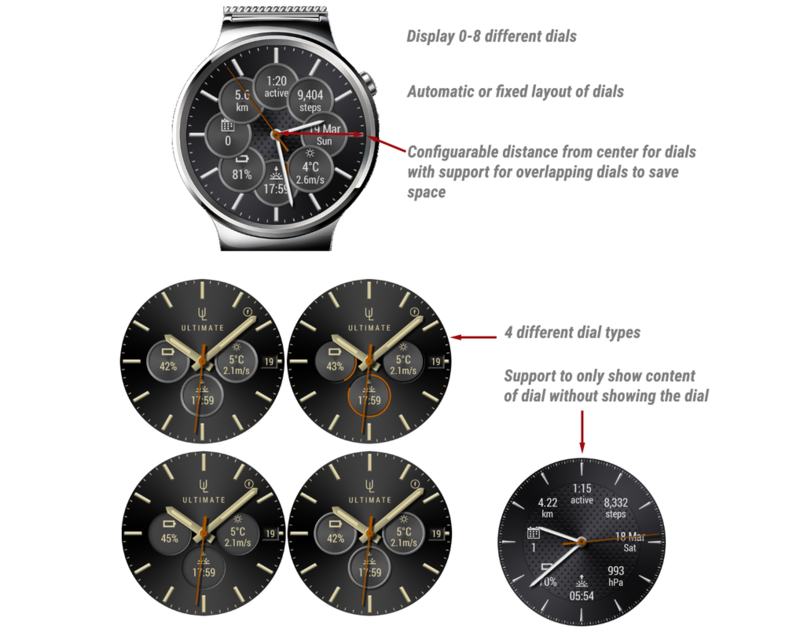 Change the distance of each dial from the center of the watch face. You can also overlap dials to save space on the watch face. Choose to show progress as an analog hand indicating the progress of the dial. This will also be stored in the preset. Choose to show the progress rings around the dials. This will also be stored in the preset. Choose to show the dial even if there is currently no data to show (applies to external complications). Enable or disable fast dial switching. Fast dial switching is activated by touching the center of the watch face.